Since 2016 we have been operating a Broads Boat Recovery Club, covering the entire Norfolk Broads (both Northern and Southern rivers). 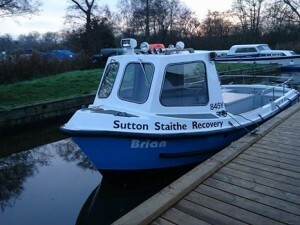 With a membership fee of just £100.00 per year you get total peace of mind where ever you are, and that you will not be left stranded by the breakdown of your boat. We will guarantee to come and recover your boat with our purpose built tug, towing you to either a boatyard of your choice (within 10 miles), your home mooring or our own boatyard, 24 hours a day. For an additional £40.00 P/A we will also cover and resolve prop fouling problems. This will include towing you in, lifting your boat and clearing the prop, (inspection of the prop) and relaunch.